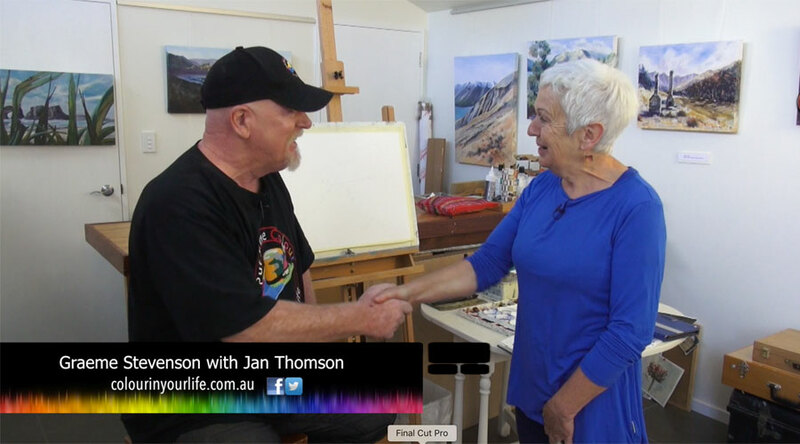 Jan Thomson’s painting journey began late, She first picked up a brush when her children had grown up. Jan began with watercolour and then took up oils. She learnt to paint by going out to Wellington’s (sometimes wild) south coast, wrestling with the elements and trying to put down on paper what was in front of her. Jan Thomson found this often frustrating yet sometimes a thrilling journey to embark on. At times She has been bitterly disappointed with her efforts, at other times awed by what she has managed to capture. Jan believes that’s what keeps a painter painting, you never know if the next one will have the wow factor! Jan Thomson moved from Wellington to the South Island which has meant new subjects, new colours and new friends. She has been helped along the way by many generous artists, who’ve shared their knowledge and expertise. This has inspired her to take a turn to help others to pick up their paintbrushes and have a go. Jan’s paintings are also available at Culverden Gallery ,KiwiArt Gallery in Wellington and Van Helden Gallery in Eastbourne . Jan’s exhibits with the Suter Art Society and Watercolour New Zealand. Jan also holds regular exhibitions and run workshops from my studio (korimakostudio.com) as well as working on commissions.